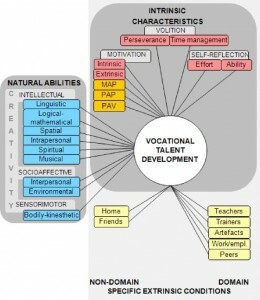 The research approach is adapted from earlier studies of WorldSkills competitors in Finland, which relied on a multidimensional model of vocational excellence comprising three main explanatory factors (see Figure 1). Natural abilities include intellectual, affective and bodily-kinesthetic abilities (expressed as Multiple Intelligences domains). Intrinsic characteristics include volition (perseverance, time management), motivation (intrinsic and extrinsic factors) and self-reflection (attributions of performance to effort or ability). Extrinsic conditions include the influence of home and family, as well as trainers and teachers, peers and work experiences. These are measured through self-report surveys. What are the natural abilities, individual characteristics, and extrinsic conditions that contribute to the development of vocational excellence? Which abilities, characteristics or conditions are most associated with top-level competitive performance? MAP, PAP and PAV refer, respectively to mastery goal orientation, performance-approach goal orientation and performance-avoidance goal orientation. The participants in the study are members of the WorldSkills UK squad who were/are in preparation for the WorldSkills Competitions (WSC) in 2011, 2013 and 2015. Squad members were/are surveyed prior to selection of the Team UK members who compete at WSC. A control group of young people preparing for vocational fields, but who do not participate in WorldSkills UK training or competitions, are also surveyed. Due to small sample sizes, statistical analyses are performed with non-parametric methods and non-frequentistic Bayesian Classification Modelling, a method that allows linear and non-linear statistical analyses of discrete variables without technical limitations related to sample size or normality assumptions. To address the study questions, survey results are compared for different groups: squad members versus team members; medal winners versus non-medal winners; and WorldSkills UK participants versus non-participants (control group).